Join as WYAD Max 94.1 FM celebrates their 4th Anniversary on the air and includes a special presentation recognizing Yazoo Legends in Radio that paved the way for the DJs of today! 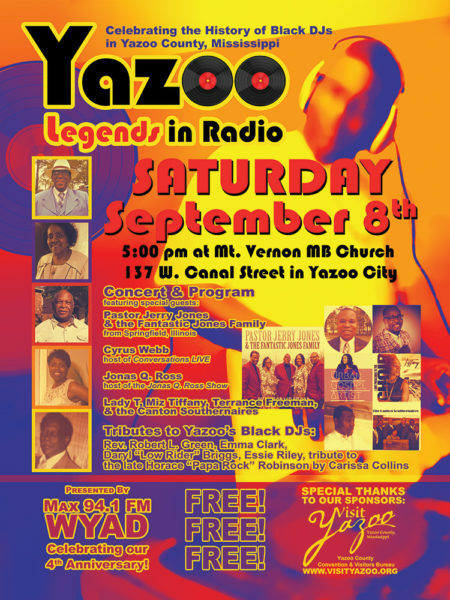 Max FM 94.1 WYAD will be celebrating our 4th year Anniversary and the history of black DJ’s in Yazoo County on Saturday, September 8, 2018 at 5:00 p.m. at Mt. Vernon M.B. Church, 137 West Canal Street, Yazoo City, Mississippi. We have put together a GREAT program to give back to the community for supporting us. We have strived to bring the BEST to Yazoo City whether it was through gospel music, devotional sermons or talk shows. We feel our accomplishments have met all expectations. To show our appreciation to the community we have invited Pastor Jerry Jones and the Fantastic Jones Family from Springfield, Illinois to be our Special Guest for this occasion. Pastor Jerry Jones and the Fantastic Jones Family is a family group whose songs range from traditional quartet to a more contemporary flavor. The Family has performed with and opened for Gospel Greats such as The Canton Spirituals, Spencer Taylor & The Highway Q.C.’s, The Jackson Southernaires, The Williams Brothers, The Mississippi Mass Choir, Dottie Peoples, The Pilgrim Jubilees, Luther Barnes, Doc McKenzie & The Hi-Lites, Lee Williams and the Spiritual Q.C.’s to name a few. The Fantastic Jones Family is committed to spreading the gospel of Jesus through song. Their latest project, By the Grace of God, lead vocalist, Pastor Jerry Jones is full of raw emotions with siblings Jackie, Pat, Robert and Clifton backing him up. Their music performances are spirit-filled, energized, electrifying, exciting and explosive!!! By the Grace of God is the lead single and title of their current project. So “Mark Your Calendar” for Saturday, September 8, 2018 at 5:00 p.m. at Mt. Vernon M. B. Church as Max FM 94.1 WYAD presents their Fourth year Anniversary and to recognize some of Yazoo City’s radio personalities from the past. We will give Tribute to Daryl “Low Rider” Briggs, Essie Riley, Emma Clark, Rev. Robert L. Green and the late Horace “Papa Rock” Robinson. For additional information, please call 662-746-7552.